I moved to Flemingsberg, a suburb of Stockholm, in 1997 and have been interested in the suburb’s special environment and conditions since then. Something new develops in the relationship between the centre and the periphery, in the meeting between town and country. New centres are continuously being created within and around us. Yesterday’s self-evident centre may no longer be important today. I often use textiles to portray everyday life around me. In pieces of fabric, I see opportunities for meeting around differences, joined together in handwork and universal decorative traditions. I also use my handicraft as a way of presenting art to groups that do not usually come into contact with contemporary art. In Flemingsberg, I have met many people who, like me, are new to the place. 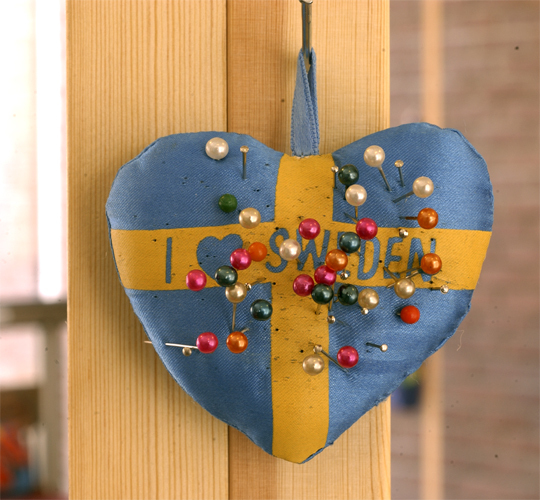 People who, for various reasons, have come from other parts of Sweden or other parts of the world. I used to go the open nursery school with my son and we would sing the nursery rhyme “A little Cabin in the Woods” there together with the other children.This song describes the rabbit fleeing from the hunter but it also asks whether we are prepared to open our door to a stranger, for someone seeking protection.I have talked to people, who have shared with me their personal narratives and songs with similar themes. Over the years, a portrait has developed of the people and architecture in Flemingsberg. For some years now, the exhibition has been touring Sweden. To start with, it only consisted of my picture of other people’s narratives but now I invite local groups to a workshop in computer embroidery to tell their own stories. My description of my home area then encounters pictures of other places and contexts. The work done locally broadens and deepens the questions raised in the exhibition. I have also been able to borrow some of the works for my tour. In this way, the exhibition has undergone continuous development and I have been able to take my experiences and knowledge with me about the new Sweden that is emerging.